Available in the USA and you will only find it on LivingSpinal.com! Segfree is just one of the many Seated Self-Balancing mobility products available at Living Spinal. Click on the guide above to compare. Ships only to North America. The Segfree adaptation allows a person to ride the Segway while seated. 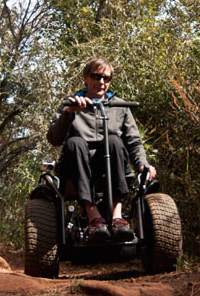 It is suited for the elderly, amputees, paraplegics or anyone with limited leg function. This seated Segway attachment is the most innovative solution we have found for daily use. It not only allows you to maneuver around your town with the power and speed of a Segway, it also has stabilizing legs that will drop down to support you at a dinner table and during transfers! This is extremely important in order to use the unit throughout your entire day, in any situation. It will not only save battery life, it will also allow you to use your Segway in more places than ever before! You simply take a Segway I2 or X2 and add the Segfree to the top of it and off you go. Call or ask for Segway pricing at info@livingspinal.com or (619)810-0010. The Segfree is made with durable mild steel and is given a heavy duty powder coated finish for durability. Built with longevity in mind, the Segfree has twin THK heavy duty rail sides for strength. In addition, the Segfree has been engineered with landing gear to help you get on and off of your seated Segway! Innovation and Inspiration for your freedom! The Segfree is an innovative and inspiring set of wheels that allows the family to play and have fun, safely and comfortably. Go for strolls with your spouse while holding hands, long walks on the beach or hiking in the park in ways that was thought impossible in a normal wheelchair. This new addition will give anyone a smile when they see you cruising by! - Only 25 inches wide, fits through all standard doorways. - Wide 33 inch base for outdoor stability. - 12.5mph speed. Fast and exhilarating. - 12.5 mph speed. Fast and exhilarating. - Astounding 24 mile range. - 18 mile range. how the hell can they put a price tag like that on the thing when you buy a whole brand new car for less and even have it change for disable driving for less, it's a it should not be more then 5,000 and even then that is expense!!! !